Wow! What a fantastic effort by the Fast + Epp | UniverCity team at CANstruction Vancouver 2018 that took place at Lougheed Town Centre in Burnaby, BC. Bunt & Associates is very happy to support this important initiative by way of Gold Sponsorship. 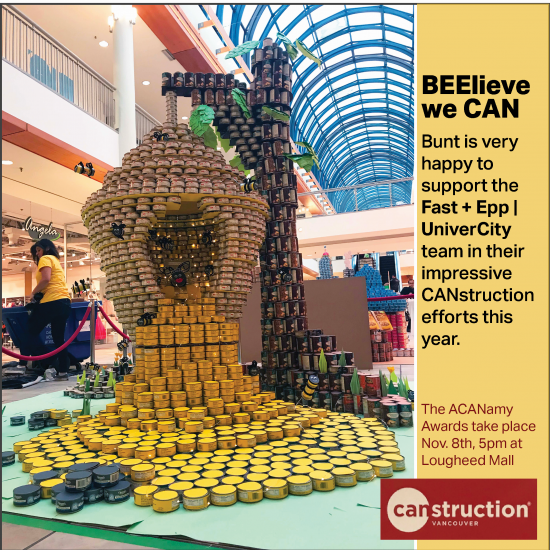 The “BEElieve we CAN” sculpture is located on the lower level by the London Drugs/IHOP entrance with the ACANamy Awards taking place November 8th at 5pm. We “BEElieve” this creation will receive a good deal of votes! Most importantly, 100% of the proceeds of CANstruction Vancouver goes towards the Greater Vancouver Food Bank. Great job everyone!